Coronary artery disease (CAD) is caused by an inadequate blood supply to the heart, which in turn is usually caused by blocked arteries. 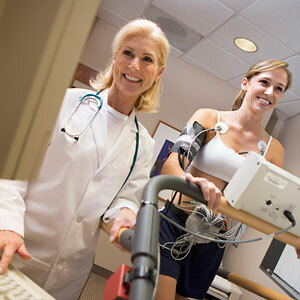 A stress test is a test to evaluate the condition of the heart muscle. Stress tests have been around since the late 1960’s and come in many forms. The nuclear stress test is very extensive and accurate. It lasts about 2 hours. It involves an injection of a radioisotope, which circulates in the bloodstream and shows if the heart muscle is receiving an adequate blood supply under stress and rest conditions. The imaging part of the test is done on the Siemens E.Cam, the most popular gamma camera in the world. It has an open design to ease the process for patients in wheelchairs, on stretchers or for those suffering from claustrophobia. Images of the heart are taken at rest and the patient is then asked to walk on a treadmill to achieve a certain level of stress. If the patient cannot walk, the prescribing physician may request that the test be done using a vasodilator, a drug that opens up the blood vessels the same way that exercise does, simulating the stress on the heart. Images of the heart are taken again after the exercise. This shows if any of the arteries are blocked or narrowed and if there is any damage to the heart muscle. How to Prepare for Your Nuclear Stress Test.